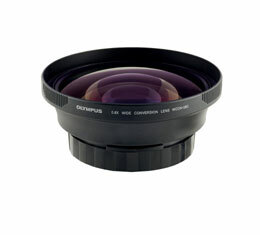 The WC0N-0.8D Wide Conversion lens decreases the magnification of your subject by 0.8x (35mm conversion of 22.5mm) when your C-8080 Wide Zoom is set to the wide-angle position. This will help you include more in the picture when shooting skylines, group shots, or houses, just to name a few types of shooting situations. The C-8080 Wide Zoom model requires the CLA-8.